This unique exotic 'bottlebrush plant' has the most eye-catching fluffy red cylindrical flower heads during late spring and summer - hence the name! It produces the most delicious lemony citrus scent as you brush past it - a scent much different to other common plants in the garden. It's a very versatile plant and perfect as specimen in the lawn, against a wall or fence, or stunning planted in large pots as a tropical feature on the patio. Callistemon will grow to about 1m tall, is extremely drought tolerant and is even winter hardy to -5C in the UK making it a fantastic low maintenance plant for any size garden. Supplied as an established 3 year old plant in a 2.5L pot approx. 50-60cm tall already, ready to plant out or re-pot. Who could resist touching the fluffy red cylindrical flower heads that drip from the branches of this evergreen shrub during late spring and summer? Not many. But this native of Australia has more going for it than just its 'stroke me' qualities. The tiny leaves that cover its arching branches release a delicious lemony scent when brushed, and its arching branches provide all year round interest. Wherever you plant it its perfect as specimen in the lawn, grown against a wall or fence, or planted in large pots. A real sun lover, give it the brightest spot possible. You need to water a bottlebrush for its first season, but when established plants are extremely drought tolerant. Despite heralding from warmer climes this plant is incredibly tough and will easily cope with temperatures down to -5C protect it in harder winters by covering with fleece or grow in pots so it can be moved indoors (a shed, front porch, garage or conservatory would be ideal). Supplied as a 3 year old plant in a 2.5L pot, ready to plant out. Callistemon will flower best when grown in full sun in moist but well drained soil in a sheltered position away from cold winds. Outdoors, Callistemon (Bottlebrush) look great in mixed borders especially if combined with other drought tolerant plants such as salvias and lavenders. Generally unfussy as to soil, poor soil benefits from the addition of plenty of organic matter. Once established plants don't need special attention and are generally problem-free. Pot-grown trees can be planted at any time of the year as long as the soil is not waterlogged or frozen. Dig a square planting hole 3 x wider than the roots of the shrub you're planting and mix some well-rotted compost or manure with the soil from the hole and use this to re-fill once the shrub is in place. Before planting soak container-grown shrubs thoroughly and allow to drain. Remove your Callistemon from its pot and tease out a few of the roots. Add Mycorrhizal fungi to the roots when planting to help plants establish quicker. Place your tree in the hole at the same level at the pot, refill, firm, and water well. Mulch around the base of the plant. Plants can also be grown in a pot using a good quality soil-based compost. 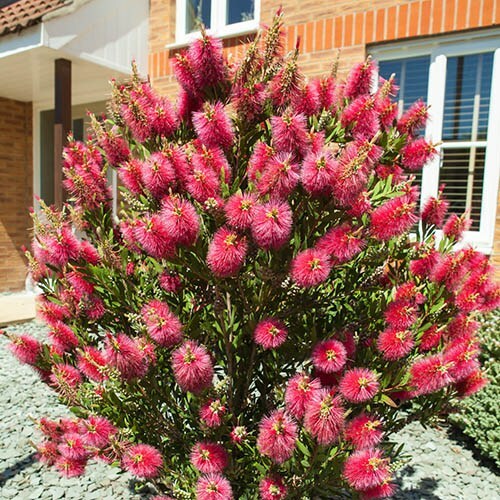 Although drought-tolerant, Callistemon requires regular watering. Feed with a general-purpose liquid feed in the growing season and top dress in the spring. Callistemon can get out of hand under glass so restrictive pruning may be necessary to keep their shape. Hardy in the UK down to -4°C! In very exposed sites, a fleece cover and mulch will see them safely through the winter. Potted plants can be moved to a cool conservatory or greenhouse. Lightly prune after flowering to keep them under control, cutting just behind the spent bloom. Callistemons in general don't like hard-pruning, so just remove spent flowerheads immediately after flowering, or trim new growth to maintain shape.